Your Grandpa is a special member of your loving family. Give him one of these handsome Personalized Grandpa Gifts as a thoughtful way of saying I Love You. He will look great and feel great wearing it at family events or out on the golf course. Your Custom Printed Grandfather T-Shirt is available on our premium white 100% cotton Personalized T-Shirt, machine washable in adult sizes S-3XL. Also available in Ash Gray. Includes FREE Personalization! 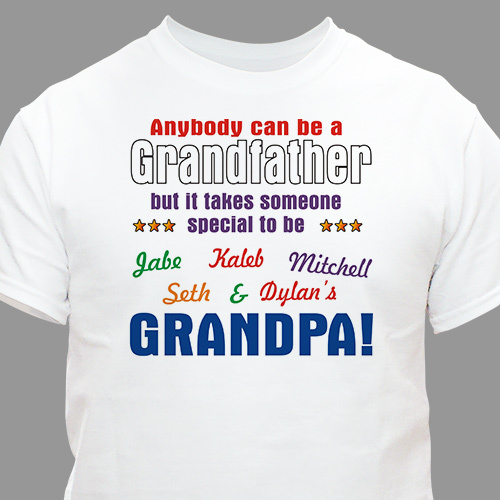 Personalize your Grandpa T-Shirt with up to 30 names. Other than a grammatical error my husband is very happy! Love it and the material is great! GiftsForyouNow.com offers a big selection of Personalized shirts that are perfect for Father's Day. In addition to our Personalized Father's Day shirts, we offer personalized Fathers day Frames, Personalized Polos & Personalized Fathers Day Keepsakes. For everything Father's Day... Visit GiftsForYouNow.com.